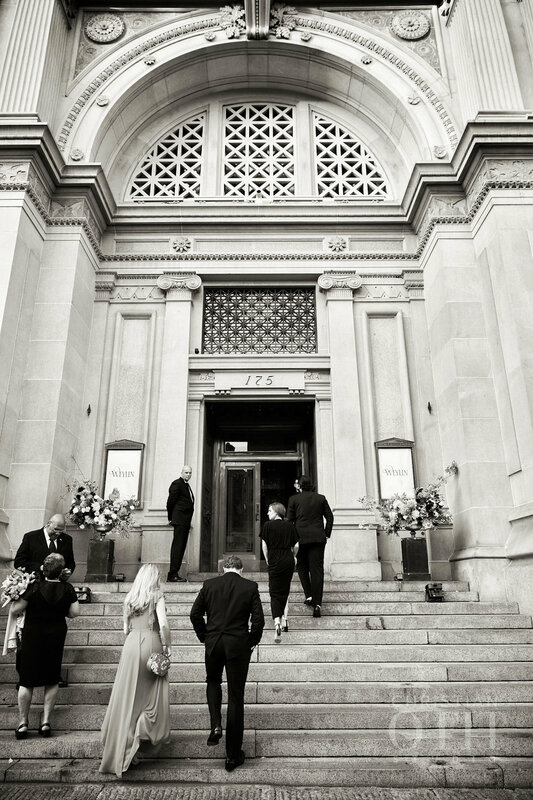 Katie and Paul were married at the magnificent Weylin in Williamsburg on a beautiful October day. 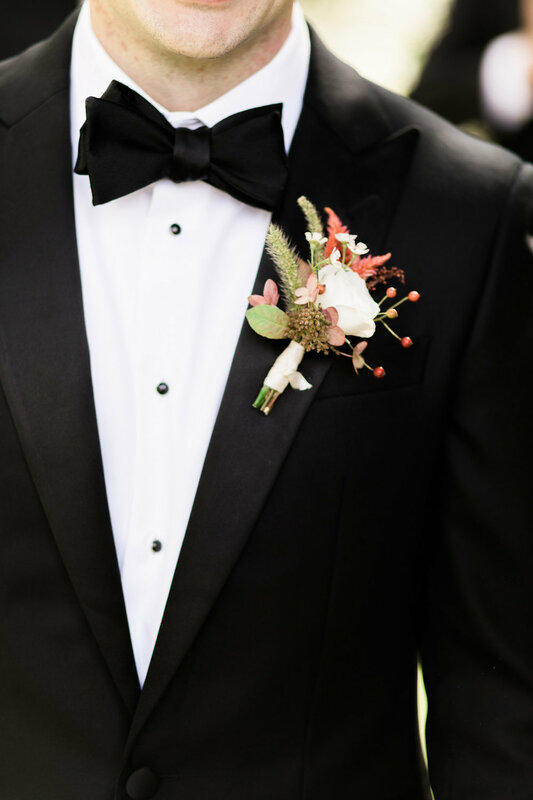 The bridesmaids wore black dresses of their own choosing and they looked so elegant with the groomsmen in their tuxedos. Katie wore a gown by Lela Rose with beautiful textured floral details. 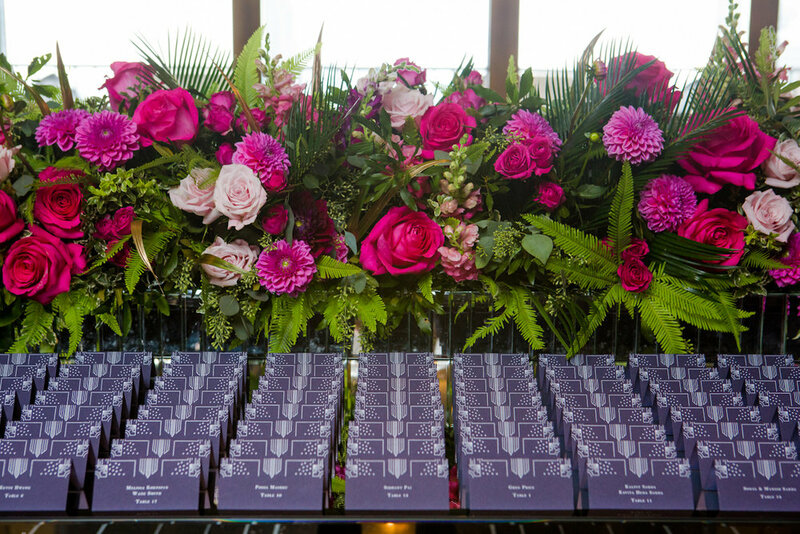 The hint of colour for their wedding started with their invitation suite by Katie Fischer Design, which had gold foil stamping on dark grey stock and exquisite pink and burgundy watercolour flowers with more foil details. 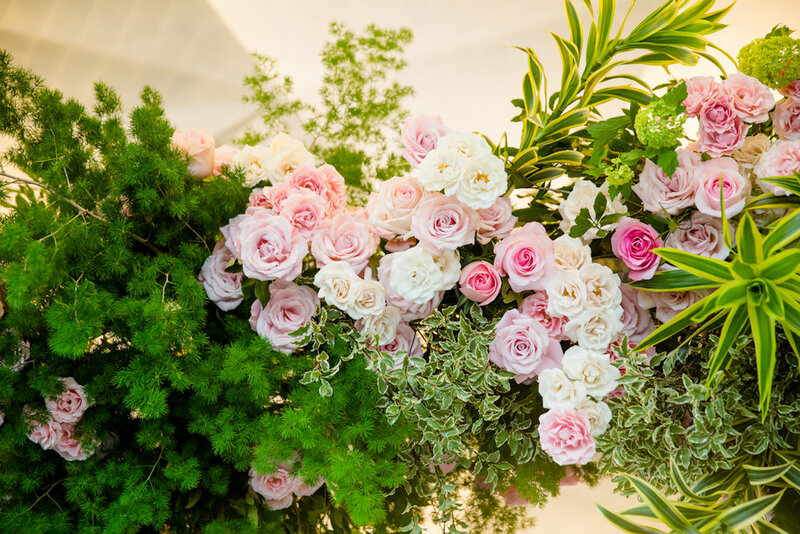 Poppies and Posies brought in their lush and organic florals with a romantic palette of creamy whites, blush, rich burgundy, green and gold. I loved how we continued the watercolour details on their day of paperie and how that complimented all the real flowers that day! 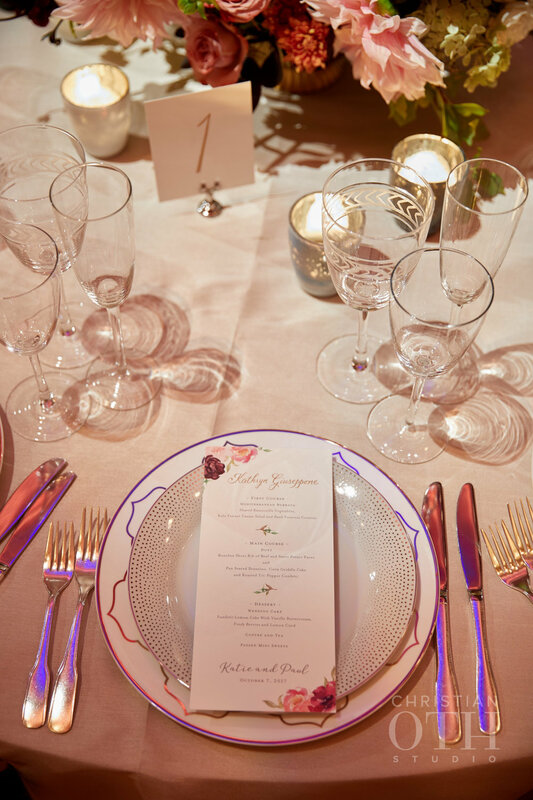 At each place setting, we had a double charger setup with the guest’s name written in gold hand calligraphy at the top of each menu. 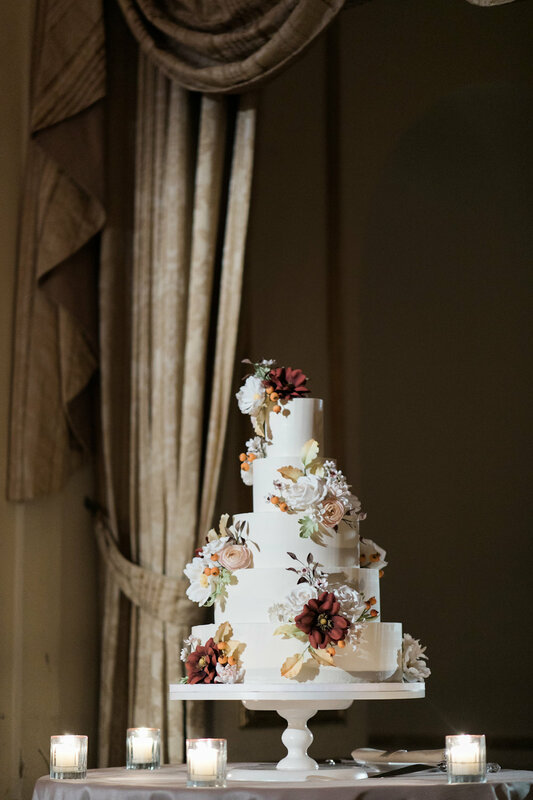 The 6 tier wedding cake from Nine Cakes had ribboned buttercream, swiss dots and brushed metallic gold with a romantic cascade of sugar flowers. Inside was lemon funfetti cake, layered with vanilla buttercream, lemon curd and fresh raspberries. Sound House from Elan Artists kept the dance party going all night! The after party continued downstairs in Bar 1875 with savoury late night snacks. Their day was captured by the wonderful Jack Jeffries at Christian Oth Studio. 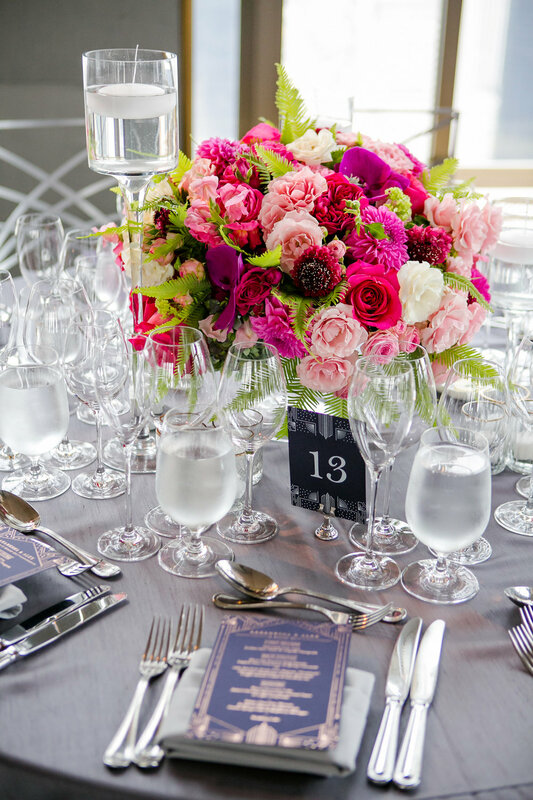 This was one of our favourite weddings at Wave Hill. 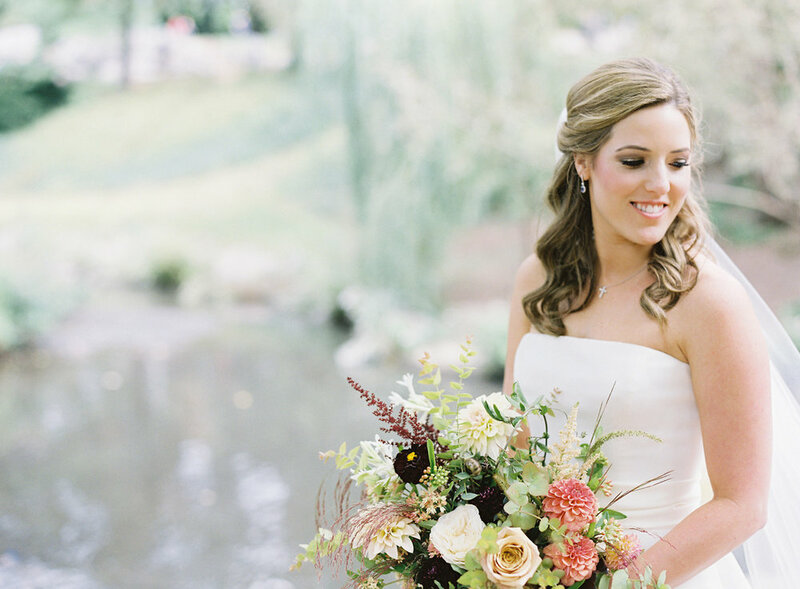 There is nothing like spring in the gardens and working with Sarah and Arjun on their wedding was so much fun! I am absolutely delighted to see their wedding published in BRIDES! Click on the image below to read more about their sweet celebration. 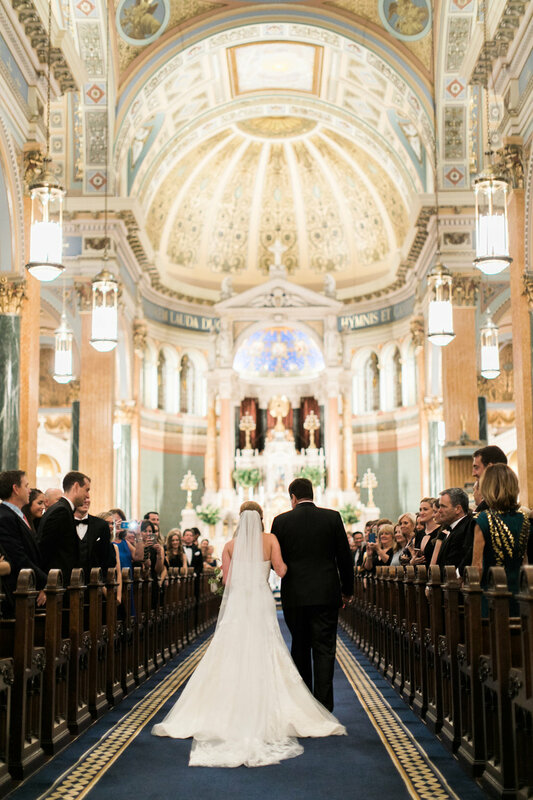 Carly and Bobby were married at St Jean Baptiste Roman Catholic Church and the reception followed at The Plaza Hotel. 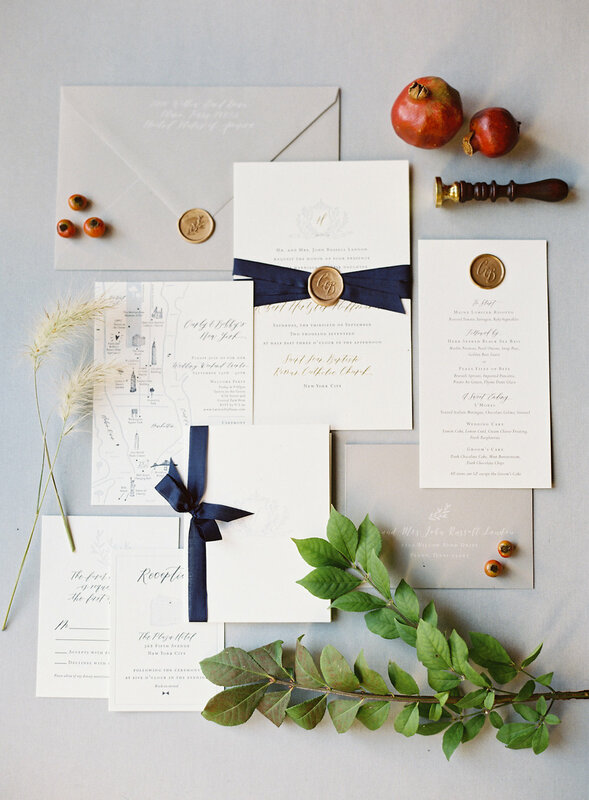 The gorgeous invitation suite from Fourteen Forty set the tone for this wedding with calligraphy details, hand drawn monogramme, navy ribbon wrap and a metallic gold wax seal with their initials. 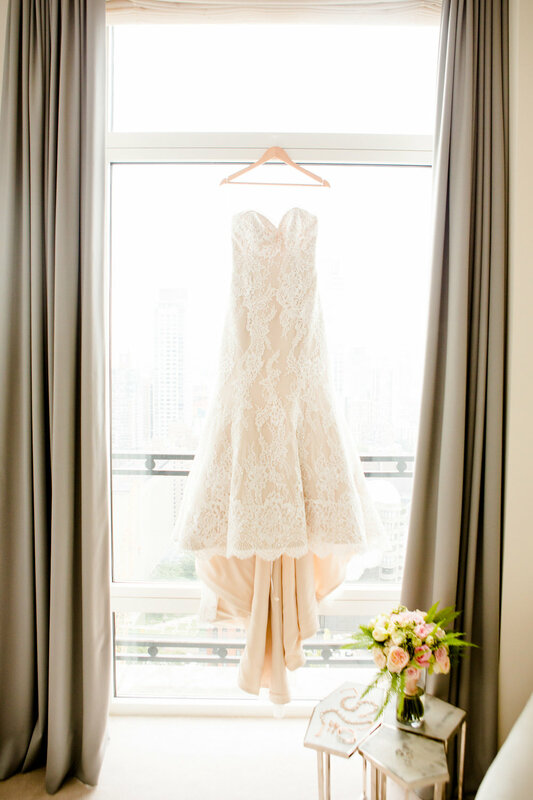 Carly wore a timeless Vera Wang gown with lace details and a beautiful sash and bow. 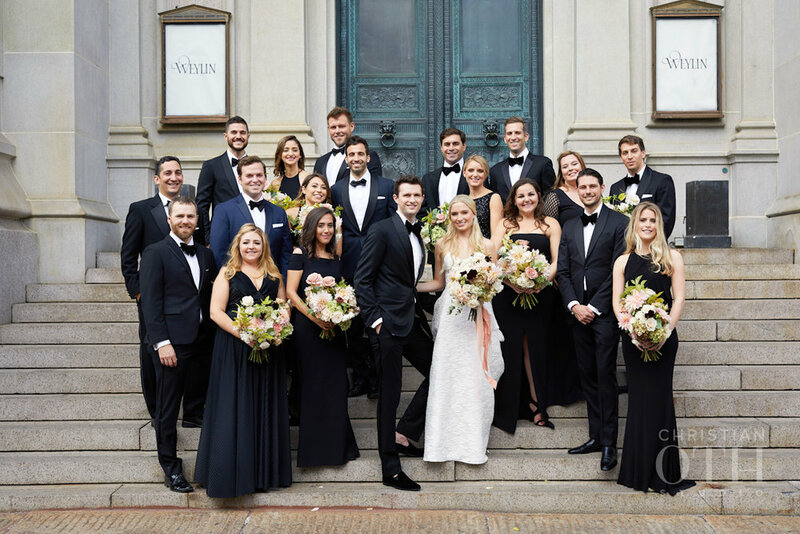 The bridesmaids in different styles and shades of blue with the gents in classic black tie made for a very good looking bridal party. 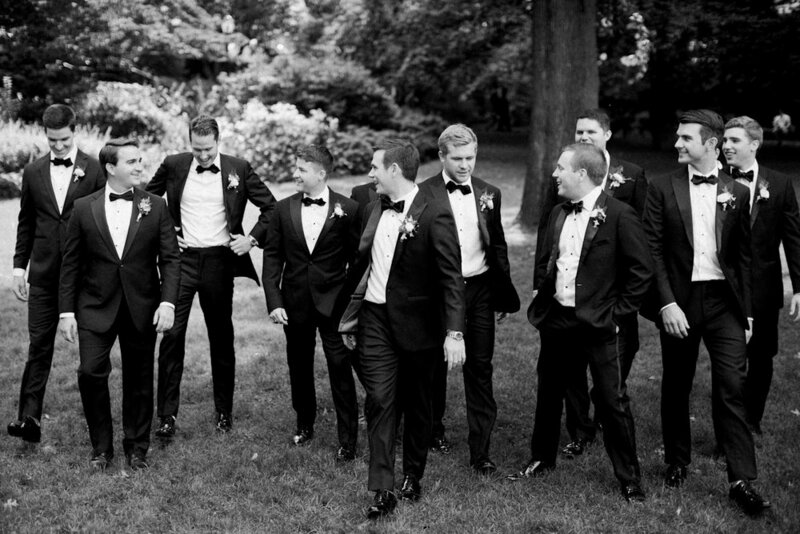 It was the biggest one we’ve had to date with 13 bridesmaids and 13 groomsmen! Putnam and Putnam created a refined autumnal palette of cream, mauve, gold and deep rust red. 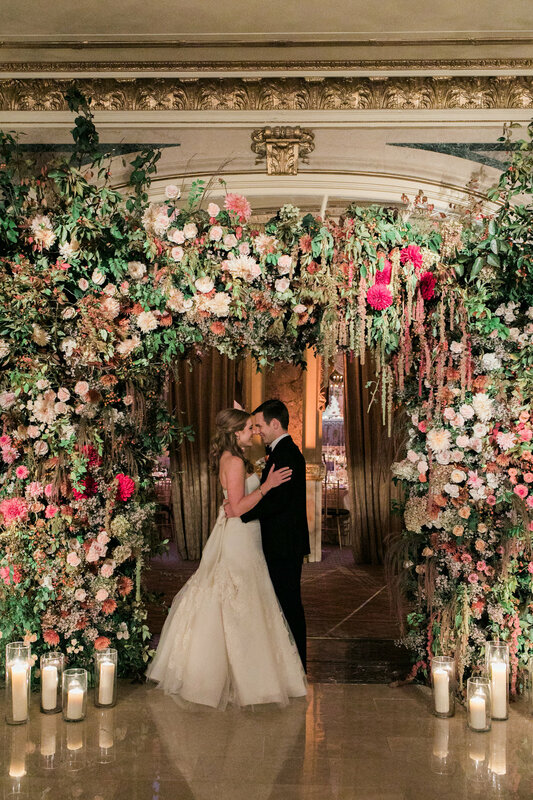 They blew me away with the stunning floral arch they built at the entrance to the ballroom for dinner. 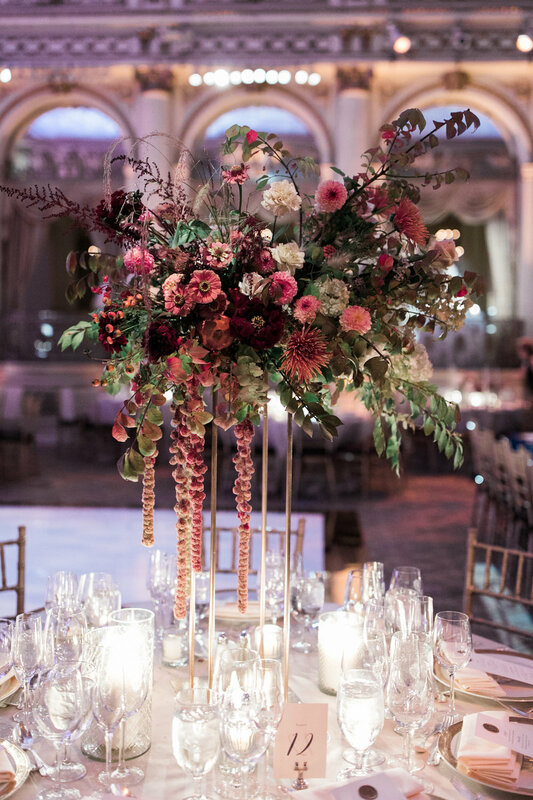 Inside the magnificent ballroom, we had a mix of low florals in brass footed vessels, tall arrangements on four post brass stands and slender ivory taper candles. 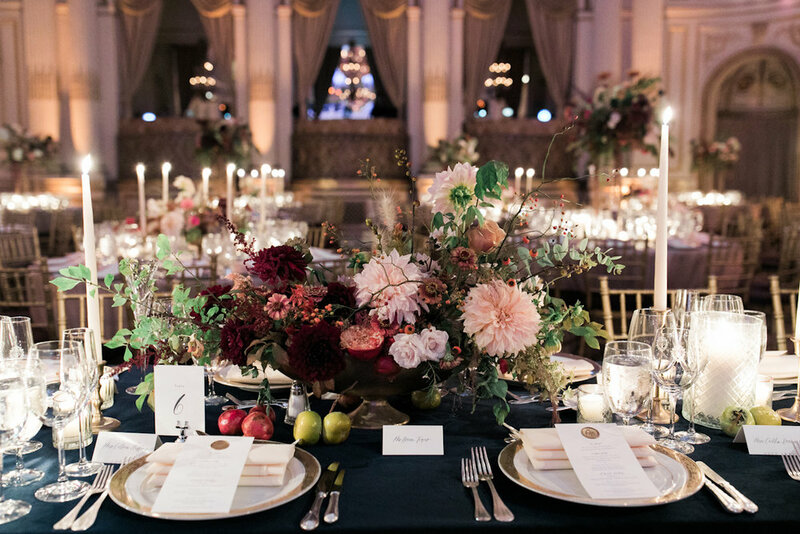 They incorporated berries, green pomegranates and deep red persimmons in the tablescape, which really popped against the rich navy velvet linen for the head table. The top of each menu had a gold wax seal. We brought in a white dance floor from Hitech Events with a custom geometric design using black and gold mirror. Cafe Wha rocked the party and that dance floor was packed all night long! Nine Cakes designed the gluten free wedding cake, which was lemon cake layered with lemon curd, cream cheese frosting and fresh raspberries. Carly surprised Bobby with a groom’s cake of dark chocolate, mint buttercream and mini chocolate chips. It was a green leprechaun hat with a gilded clover and a gold Notre Dam emblem. We ended the night with a bang, as we passed out confetti sticks. Their nearest and dearest showered Carly and Bobby with confetti and so much LOVE! All captured by the lovely Judy Pak. 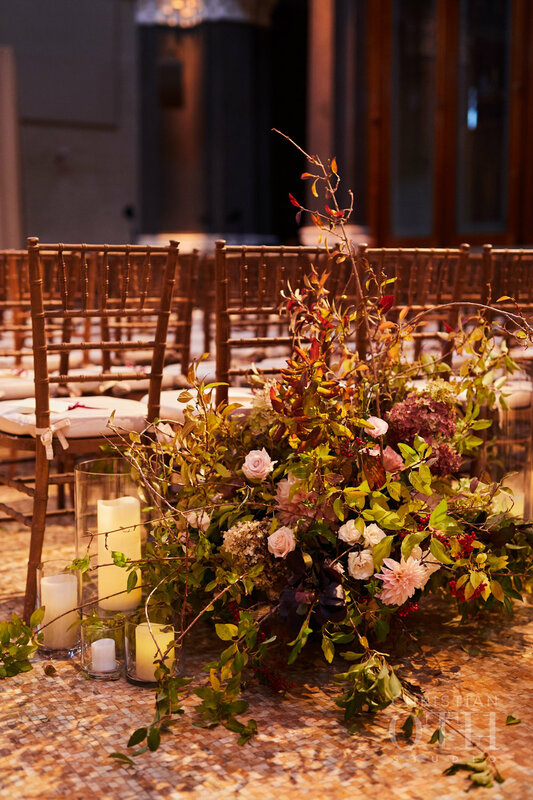 As the weather is starting to turn cooler in New York, I'm thinking back to this gorgeous autumn wedding at Blue Hill at Stone Barns. 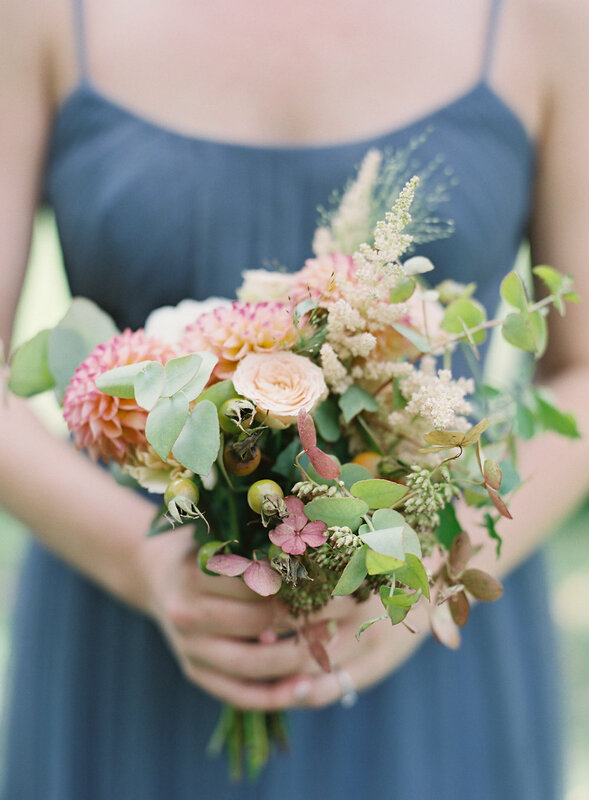 Sarna and Matthew were married on a crisp fall day at one of my favourite venues. Sarna wore a stunning vintage inspired beaded gown from Jenny Packham and fresh flowers in her hair. 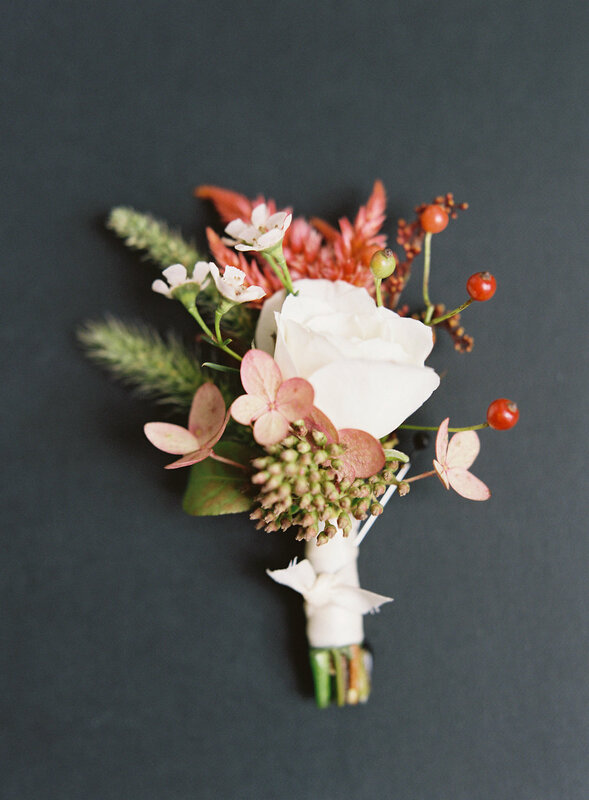 Saipua designed the florals in a creamy white and soft blush palette with accents of deep pomegranate red. 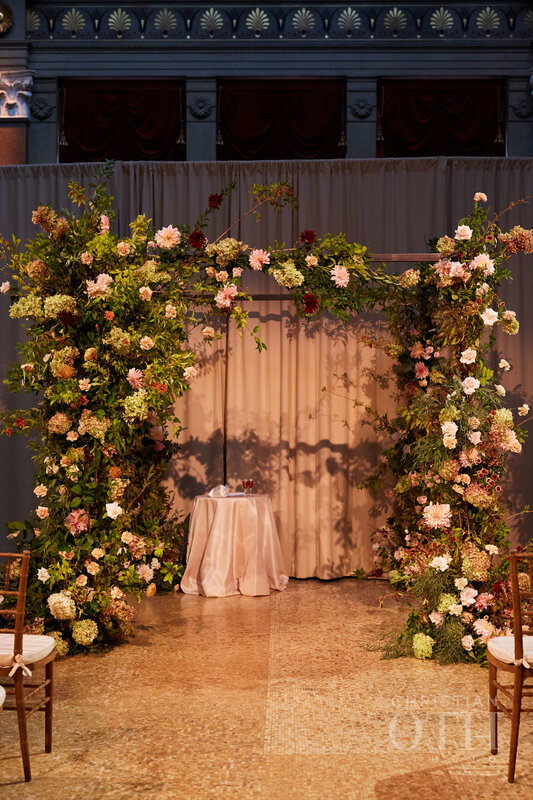 With an intimate wedding of 128 guests, we were able to setup the ceremony chairs in a circular fashion around the beautiful wild chuppah. It was an incredible feeling getting married to your love surrounded (literally) with all the people you care most about! 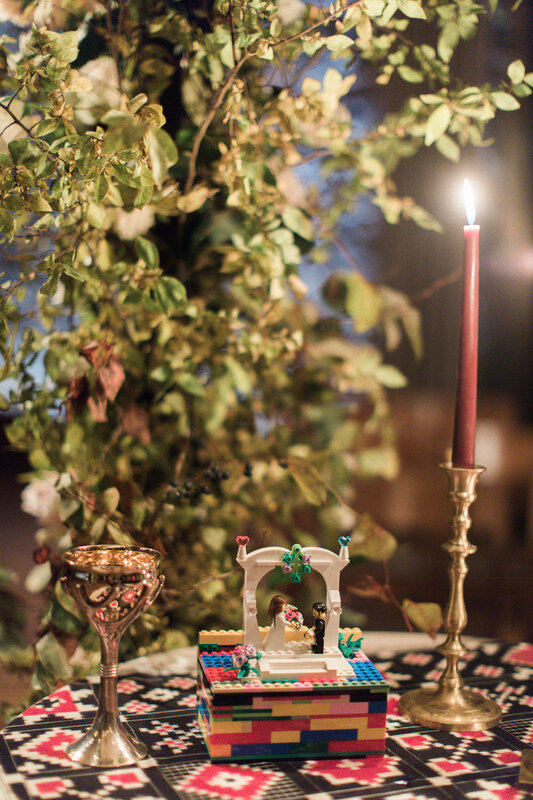 I adored the ring box (made from legos by the ring bearer) and the embroidered cloth covering the table under the chuppah (a gift from a dear friend). Another friend officiated the wedding and it all made their ceremony feel so personal and special. Sarna and Matthew found a day of the dead cake topper in a store selling Mexican art and it was a perfect nod to Matthew's heritage. The wedding cake from Blue Hill at Stone Barns was apple, crème fraiche, vanilla chiffon cake. All the food from Blue Hill was so beautifully presented, seasonal and delicious! Sean from 74 Events kept the dance floor packed all night and whole day was captured so timelessly by James at Judy Pak Studio. 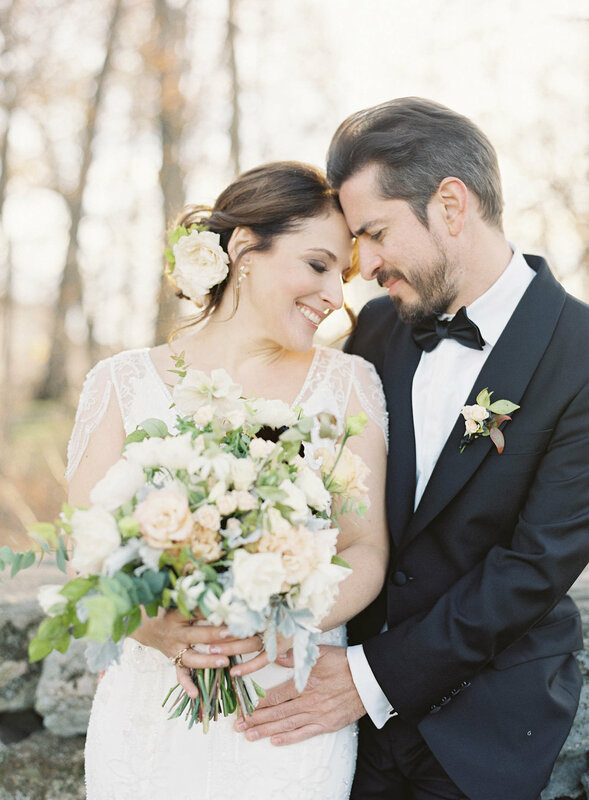 It was the perfect way for Sarna and Matthew to spend their Thanksgiving weekend celebrating with family and friends. I was so lucky to have been a part of it! 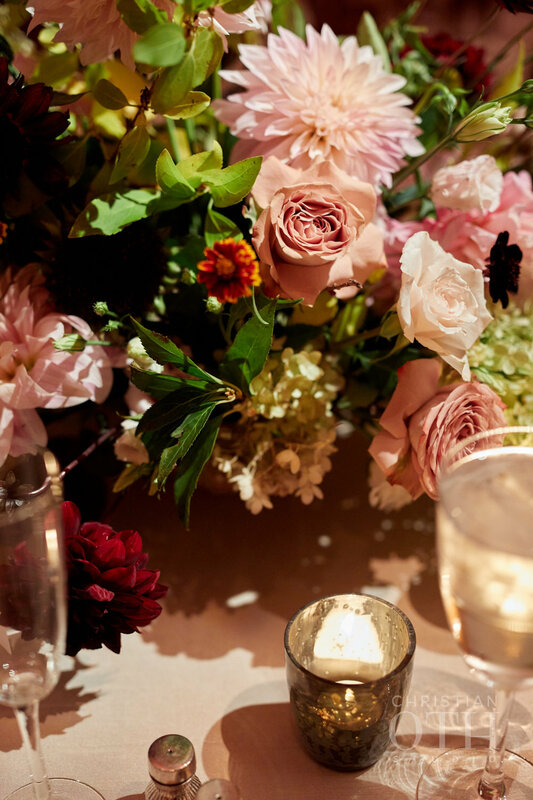 I am over the moon to see Bingqing and Han's intimate winter wedding at The Foundry in The Knot New York 2018 Fall/Winter issue! Most of our weddings are 100-300 guests, but sometimes we get to plan a small wedding for 48 and it feels extra special. 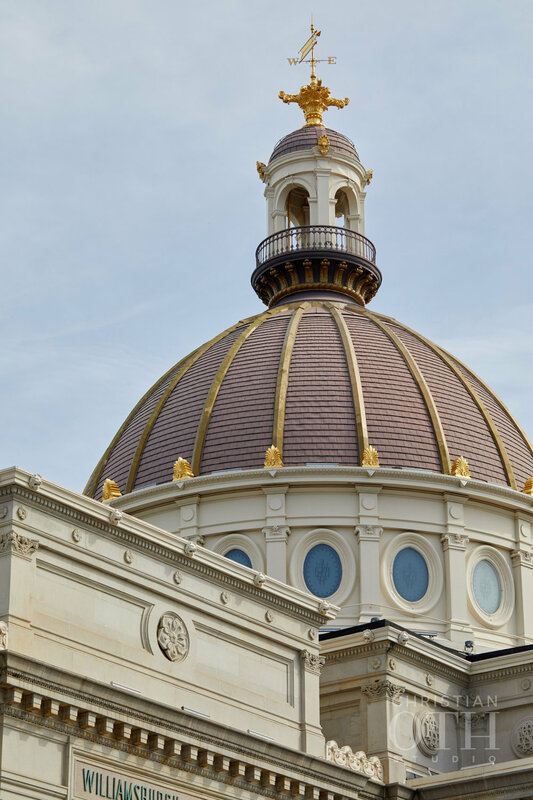 Take a look at some of the thoughtful details below! You can read more about the wedding on this blog post too. 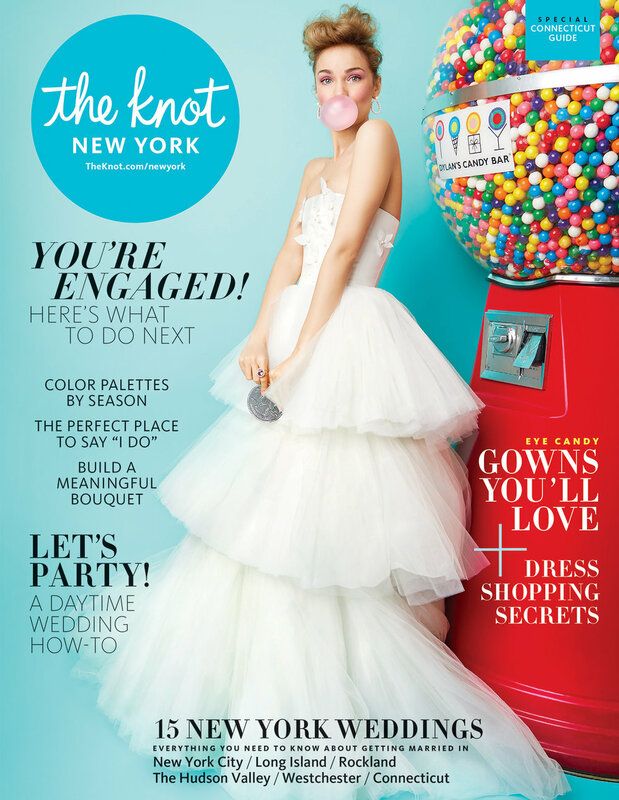 Thank you to the The Knot for sharing our work! 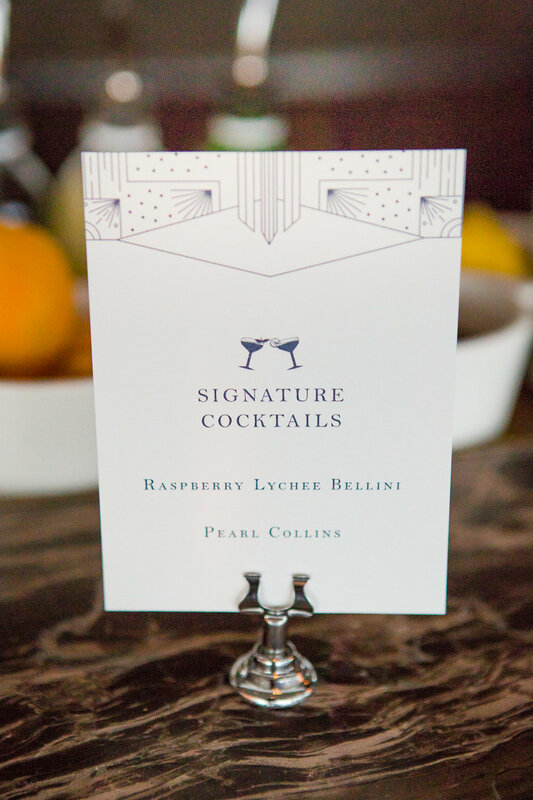 A+A's wedding started out with a lovely invitation suite by Fourteen Forty in navy and rose gold with art deco details inspired by their venue the Rainbow Room. 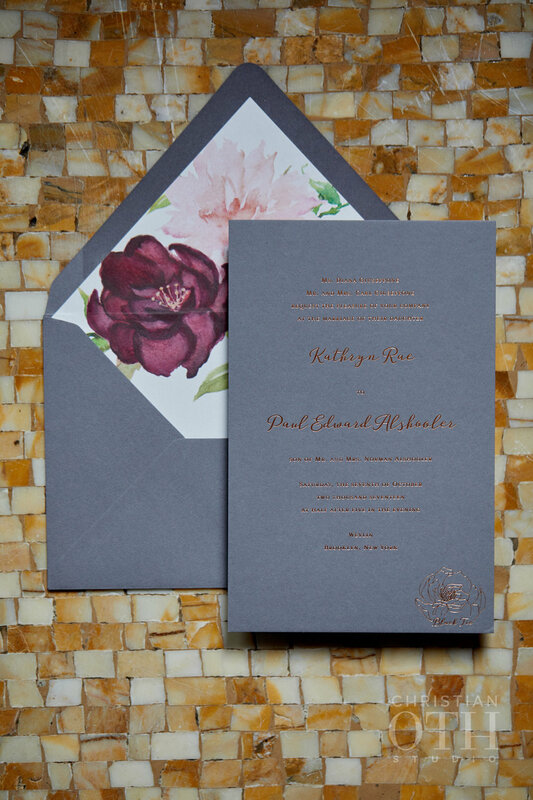 The invitation to their India wedding was also included in the same suite, with the same colour palette, but a very different design details from the New York invitation. 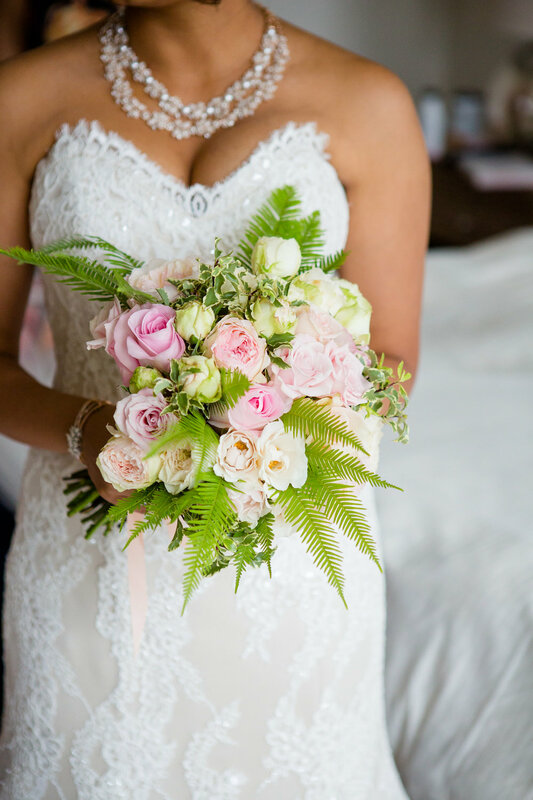 Fleurs did such an amazing job creating lush tropical greenery and florals ranging from creamy whites and blush pinks at the ceremony to hot pink accents at the reception! 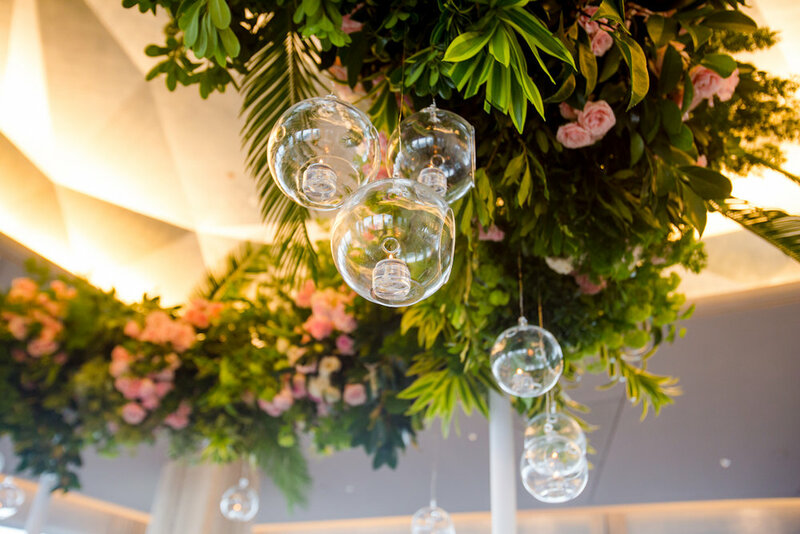 They were married under a stunning ring of florals with hanging globe votives. 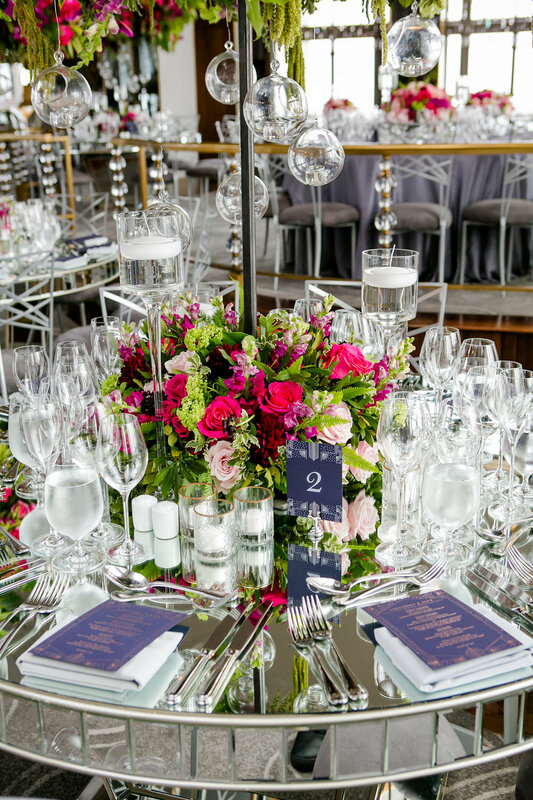 The tall circular floral arrangements high above the mirrored tables from Luxe were such a wow moment as guests stepped into the magnificent Rainbow Room. 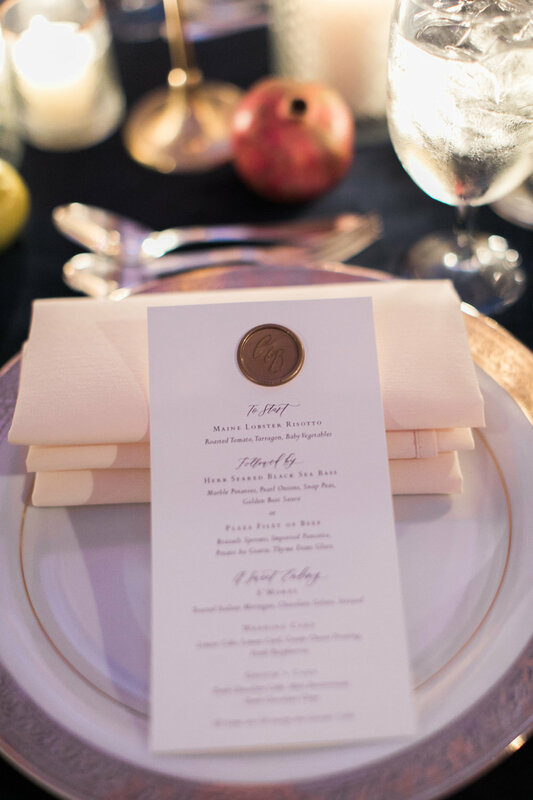 The rose gold menus added a perfect shine to the tablescape. THIS cake. Madison Lee designed the most incredible navy and rose gold cake to complement their invitation suite and everyone was blown away. We had the cake displayed on a blush patterned sequin linen from BBJ to highlight the rose gold. The music from Blaire Band impressed everyone so much, that the father of the bride even gave a speech to thank Blaire at the end of the party! 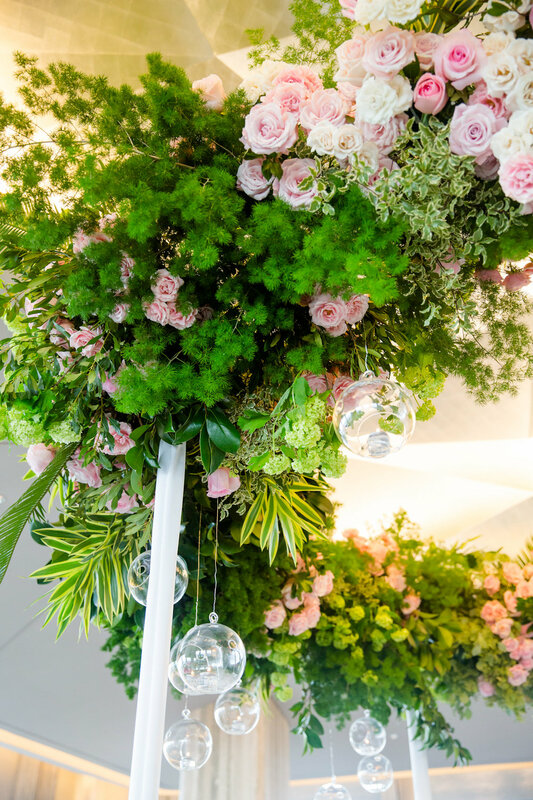 It was such a bright and fun summer celebration full of personal style!